Ungasan puts you right in the middle of Bali’s incredible Bukit Peninsula, surrounded by beauty you’ll never forget but with all the convenience of a major city. Not only is its central location good for experiencing every corner of this fantastic region, but the Ungasan village is home to shops that keep you stocked up on those everyday needs and treats. 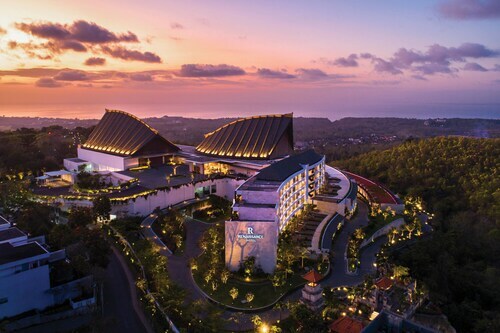 Stay with us in one of our Ungasan hotels and you’ll be set to experience divine food, refreshing cocktails and sand between your toes while being refreshed enough to explore the best Bali attractions, both new and old. It’s likely that some quality beach-time is either at or very near the top of your holiday to-do-list, and the choice couldn’t be better. Right there around the edges of the peninsula you have fantastic options like Belangan Beach, considered by some to be Bali’s best, Bingin Beach, which is tucked away under cliffs on the western coast, and the quiet beauty of Nyang Nyang, which is on the western tip near Uluwatu Temple. But you should also take note that a brilliant stretch of sand sits in Ungasan. It’s called the Green Bowl because you need to take winding paths through the forest to get to this natural paradise of trees. White sand and beautiful water await you, and even better, you’ll probably have it all to yourself! No trip to the Bukit Peninsula is complete without a visit to the Uluwatu Temple, one of Bali’s star attractions. It is one of the nine directional temples placed strategically to protect the island from evil spirits and stands proudly facing west off a hanging cliff 70 metres above the azure blue Indian Ocean. The dark stone archway and tiered main building go hand in hand with the amazing location. Be on the lookout for live performances of the traditional Kecak Dance here as well as the many monkeys who roam around – watch out, they’re master thieves! During your wanderings, you’ll find there is no shortage of restaurants, and cafes where you can sample traditional local cuisine. If you’re craving some western fare, you’ll be able to find seafood barbecues and fantastic pizzas, but don’t forget you’re in Indonesia! Pop into any small local restaurant, that’s not filled with tourists and your taste buds and stomach will be thanking you all day long. To get to Ungasan take a 40-minute taxi ride from the airport, or about the same distance from Kuta for some proper touristy shopping or partying. Taxis are also available to take you around the area, but the peninsula’s beauty and scenic roads are great for renting a motorbike and going at your own pace – just remember to wear a helmet and drive sensibly! So are you daydreaming about your holiday in the sun yet? 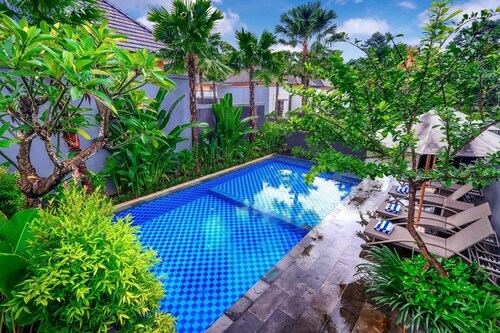 Trust us, dreams could never beat the real thing, so book into our Ungasan accommodation, check out our flights to Bali, and enjoy that dream holiday. How Much is a Hotel Room in Ungasan? Hotels in Ungasan start at AU$17 per night. Prices and availability subject to change. Additional terms may apply. We loved our time here. Breakfast was awesome, bed and pillows comfy, quiet and many facilities. Loved the spa jets in the pool. Staff were lovely too! I didn't like anything about this property. I would not recommend it to anyone. It is dirty and discusting. The rooms are incredible! Attention to detail is brilliant. Huge 1 bedroom villa, beautifully lit at night. Great size private pool, spectacular bathroom. A true 5 star luxury experience. Breakfast buffet had everything you could think of. The day spa was outstanding. Expect to pay for what you get though... food and beverages will cost you!